THE COCONUT HOUSE - MAALAEA BAY The Coconut House at Ma'alaea Harbor, overlooking Ma'alaea Bay, is a private oceanfront wedding reception property suitable for up to 70 guests. 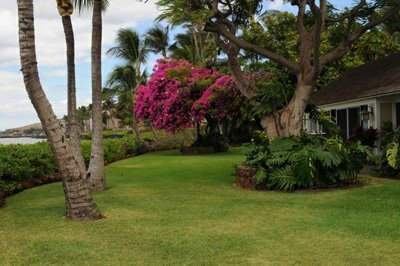 Weddings are performed on the beautifully landscaped grassy area fronting the ocean. Here we can arrange chairs, archways, isle runners, flower pathways or "circle of love" flowers encircling you while you exchange your wedding vows. Receptions for up to 70 guests are arranged on the oceanfront grass by tiki torchs. The house consists of one large room with plenty of space for entertainment and dancing. The configuration can be arranged for intimate seating or for one large space for cocktails and dancing. A large semicircular bar with state of the art kitchen dominates one corner, built in seating areas and bistro tables give this a comfortable "cocktail lounge" feeling. There are restrooms and two bedrooms in the back with sliding glass doors facing the ocean, which makes it a great place to get ready for your wedding. This is not a wedding only site. Please contact us for price and availability.